To celebrate the first extraterrestrial contact, only this week, a discount every day. Use the coupon 6EQUJ5 and find out about our daily discounts. Design your badges, stickers, magnets, skins or buy other artists' creations in our Gallery. Check out the new wall stickers! Did you know now you can create your own custom product or buy from the Gallery directly from your phone? If you have an iOS device download the app and design your souvenirs wherever you go! 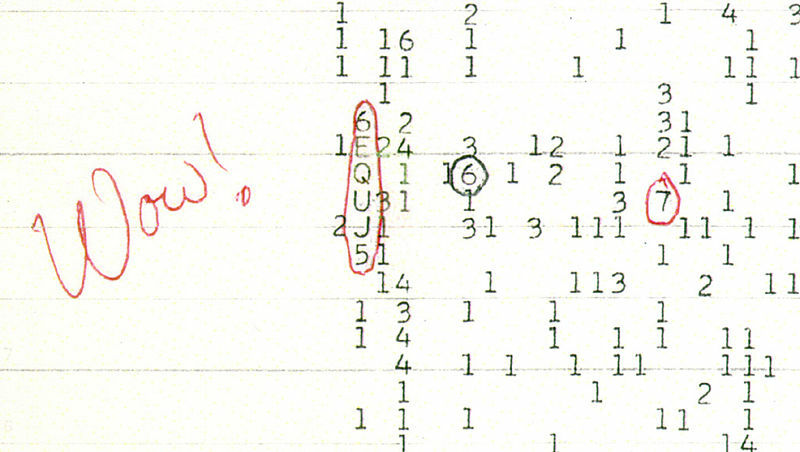 On August 15th, 1977, Jerry Ehman, professor at the Ohio State University and volunteer at SETI, a NASA organization dedicated to investigating the existence of intelligent life outside planet Earth, analyzed numerical data concerning signal power coming from the constellation Sagittarius, which were printed out in real time while captured by parabolic antennas. It was a very slow night, the printer was fully working as usual, writing down numbers like 1, 2 and 3, sometimes a 4... which meant the antennas were only capturing noise and the crackling of leaves in some empty park. Jerry knew that all white space left by the printer meant no signal at all. Anything between 1 and 9 would be marked by those numbers and for anything higher than that the printer would use values between A and Z, even though that had never happened. Jerry was used to see nothing special on those papers; he knew that, even if there was intelligent life out there, it was very unlikely that it would send or wanted to send any sort of signal, at least towards this side of the universe. But still, Jerry kept dreaming that at some point he would find a proof, even a small one, that we are not alone. With that same hope he left his house, at 10pm, after a long day at the University, to go to SETI and analyze the data collected by the big antennas. After only one hour he was so tired his eyes would fail him until, at 11.56pm, a beep caught his attention. The printer was programmed to start beeping whenever strange things occurred. It had happened before, it probably was another malfunction. He went through all data just to check everything was alright. He could not believe what he was seeing. He started circling with a pen all those small numbers that had caused the alarm to go off. A 7... a 6... and finally a whole sequence of 72 seconds made of 6... E... Q... U... J... 5... It was the first time in his life a simple letter had produced such a strong impact in his head. His pen fell out of his hands while he calculated that signal was thirty time stronger than the usual white noise. There was no doubt. He was in front of what could have been a message sent by some extraterrestrial civilization. The first one ever received and documented by humanity. We are not alone in this universe.